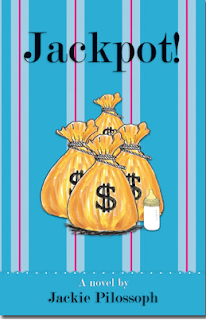 Chick Lit Central: Book Review and Giveaway: Jackpot! What would you do if your mother offered you EIGHT MILLION dollars to have a baby? That question gets answered in "Jackpot!," Jackie Pilossoph's latest novel. All Frankie Jacobson, a long time widow, wants is to have grandchildren. It seems as though every weekend, at synagogue, she’s celebrating yet another friend’s grandchild’s birth. She gets singled out because everyone knows her two children, Jaime and Danny, have not settled down yet, and it looks like they never will. Due to Jaime Jacobson’s lousy history with men, the only thing she seems to love these days is her pair of Jimmy Choo shoes. Danny is your stereotypical guy who has commitment phobia. He seems to only care about picking up women, and his teaching career. When their mother wins the lottery, she hires a lawyer to draw up a contract, for both Danny and Jaime, indicating if they produce for her a grandchild, within one year, they will receive 8 million dollars. After a short while of shock from their mother’s proposal, Jaime and Danny become obsessed and determined to get the money. Jaime attempts to use her co-worker, Drew, who’s been hitting on her for over two years. But in the middle of the second date, she starts to develop real feelings for him. Danny meets up with previous girls he’s had flings with, and then bumps into Courtney. In the process of trying to seduce and get her in bed, he falls in love with her. In the beginning of the story, both Jaime and Danny have no interest in settling down or raising a family. This is the only thing Frankie, their slightly overbearing Jewish mother, wants. Each attempt of hers to get them to realize this is like talking to a wall, and this wall keeps getting thicker. Frankie becomes so desperate, that she’s willing to bribe them with money. My first thoughts were that this is a bit over the top, and not very realistic. But hey this is fiction, so I went with it. Looking back at the story, Jackpot would make one hilarious movie. Many of the obstacles and hiccups Jaime and Danny “bump” into (no pun intended), brings a great deal of comedy to the book. I enjoy how Jackie tells the story, alternating between Jaime and Danny’s points of view. She does a great job of character development, specifically Jaime and Danny’s journey from the beginning of the story to the end. This is first novel I’ve read where an author has been so in tune with the male psyche. In different ways the characters, including Frankie, are selfish at first. But when love comes into the equation, and the family receives heartbreaking news, we see them become better people, putting others first, and being content with life just as it is. It’s important to realize you can’t force love: It will come when you least expect it. Also you can’t force people to do something they don’t want to do. On the other hand, as much as family members might annoy you, they do have your best interests at heart, especially parents who took care and provided for you. I felt the book lagged a bit over the course of the chapters where Danny is meeting up with past flings to hopefully get them pregnant. But overall, Jackpot is a great epitome of chick lit. I related to Jaime and Danny because I too have an overbearing Jewish mother. When she annoys and nags me, I have to try to remember that she just loves me, and only wants the best for me. It also made me realize that even though crappy things happen to us in life, a lot of these make us think... is this the best way to go about our lives? The book brings to light how money does not buy happiness, nor solve all of life’s problems. I recommend this to anyone looking for a light-hearted, funny, moving and “happily ever after” read. As an added bonus, Jackie Pilossoph is giving away FOUR copies of "Jackpot!" Two e-books worldwide and two hardcovers to US residents only. How to win "Jackpot! ": Tell us what you would do with eight million dollars! Please include your e-mail address (or another way to reach you) and let us know where you're located. One entry per person. Giveaway ends 11/29 at midnight EST. I've been wanting to read this book for sooooo long:) Thanks for the great giveaway guys! I would love to have the e-book, since I am not an US resident. Will tweet a lot about this giveaway! If I won 8 million dollars, I'd pay off my debts, my parents and my brother's as well. Buy myself a nice place to live. A car. Go to Portugal with my bf to meet his family. I'd open our own restaurant. Plus I'd help out some cancer society due to my close personal experience with that disease. If I had 8 million dollars First I'd pay off all my bills, go visit my mom over in England, than proceed to take a trip around the world! If I won 8 million dollars I would buy my mom a house, buy car and a place for myself, and travel. So much money, even after taxes. I'd pay off bills for myself and family members first, makes some investments then make donations for medical research and pet care. I would pay off the rest of the mortgage and repair much needed things in the house. I would definitely go on a trip to Europe (to see family) and Disneyland for the kids. New house, new car and hubby I know wants a boat. It go on... I'm a follower and I'm not in the U.S. so e copy for me. Thanks! Lovely review. My co-editor Danielle read and enjoyed this, too. If I had 8 million dollars (are you ready? I mean, seriously, 8 MILLION DOLLARS!!) I would: Buy a house in Florida. MOVE to Florida. (And have a massive library for my books. Sigh.) Buy a house in England somewhere. Give some to my parents and family and then I'd book a round-the-world ticket and you wouldn't see me for dust. I would also go see Manchester United play at Old Trafford and go to Spa for the F1 race. Then, if I had any money left (and it must be doubtful), I'd do a road trip of the USA. chicklitrevews[at]gmail[dot]com and I am located in Tenerife, Spain! I would buy a handicapped accessible house, hire a full-time nurse and move my best friend in with us. Ooh! 8 million dollar is a lot! Hmmm. I'll spend it all on chick lit hardbacks! Then I'll donate to cancer research and the orphanage. I will then buy an apartment on the Upper East Side with a lovely view! I'll furnish my lovely apartment with books and books and books! Oh wow! I cannot even imagine how much money that would be. I would first make sure my husband and I were financially secure. Then I would help out my kiddos. I would definitely support some of the charities that are dear to us. I am in the US - thanks for the chance. 8 Million dollar is a lot. Wow! That would definitly mean not having to worry about wheter or not I´ll get a pension when I retire (which is a bit senseless to think about now, but on the other hand it´s never too early, right?) :D. I would be prepared, I guess. Well, and some new clothes and a dream vacation with my best friend and my sister would on the list as well. And some to charity too. With 8 million dollars I would take my family and travel the world then I would invest and start some businesses! Pay off ALL debts for myself and family. Buy a beautiful house, shop until I drop, travel, donate and invest/save so I would never have to work again! I'd buy my kids new houses and cars, buy ourselves a new house and car. Also put money away for the grandkids college. Our church needs to build on so I'd have a super church built! What a great book! Thanks for the review & giveaway! If I had $8m I'd see that my mom & nieces were taken care of, put some back for retirement, then start a foundation to work toward the goal of 'no homeless animals'. We were just talking about what we would do if we won the lottery tonight!! What a coincidence! (Not 8 million!) Wow! I'd pay off everything, design and build a handicap accessible awesome-with-everything-in-it house, get a really rockin' wheelchair and van with a lift for my cool wheelchair, design & fill my state of the art library, house for my mom and BFF, help out the local library & schools, etc. etc. etc.........................#1 My hardworking husband who works 75 hours a week could retire!! Yeah!! Now, this will be the next giveaway, right??!! LOL! !